As a result of decades of civil war, ANGOLA, a country in south-west Africa, has the highest rate in the world of people who have lost legs from land mines. Guerrilla troops, sponsored by the former apartheid (white rule) government of South Africa, have planted millions upon millions of mines. Those injured are mostly civilians, including women and children. Supplied by giant arms manufacturers in the North, LAND MINES ARE DESIGNED TO CRIPPLE, NOT TO KILL. This is part of the strategy of "low-intensity conflict." Leaving people seriously disabled puts a greater burden on families and on the nation than does killing people outright. 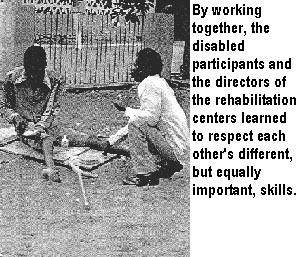 To do something for the vast numbers of civilians disabled by war, the government of Angola set up large rehabilitation centers in each province. These were intended to provide disabled persons with rehabilitation, assistive devices, and training in skills such as leather-work and carpentry, so they could soon return to their homes. But at the centers - as in the whole war-torn and economically devastated country - there was a chronic shortage of even basic materials such as leather, wood, nails, and glue. As a result, neither assistive equipment nor skills training were being provided. The rehab centers had become little more than long-term holding camps - sheltered workshops with no work. To try to find a way out of this situation, in 1990 the Ministry of Social Affairs together with the Development Workshop (a Canadian non-profit group) organized a national workshop. One director and one disabled person from each of 15 provincial centers attended. The author (David Werner) and Kennett Westmacott were among the outside facilitators. The purpose of the workshop was to figure out how to make assistive devices at low cost and with a scarcity of tools and materials. Rather than simply discuss how to make do with minimal resources, we decided to actually try to make needed aids and equipment for and with the disabled participants. if they themselves could master these skills, they could then not only help meet needs of other disabled persons, but they would have important work. To find materials, we first made a trip to the city dump. We collected bits of wire, old plastic buckets, car tires, inner tubes, and bits of metal. About the only wood available was from broken packing crates left over from international aid shipments. Also, there were branches that could be cut from the few remaining ornamental trees. To start off the workshop, Kennett showed the group how to make a saw by filing teeth into the steel strapping from old packing crates. The blade is stretched between a frame made from sticks, and tightened by twisting a wire. To get ideas for building things from scrap, we went into the streets and watched children playing with their homemade scooters, pushcarts, and baby carriages. The wheels of these were made of wood, or with large bearings from junked or bombed trucks. The ingenuity of the street children, inventing playthings out of anything at hand, was an inspiration and challenge to all. LEARNING TO MAKE ASSISTIVE DEVICES. During the 2-week workshop, the group managed to make a wide variety of assistive devices. These were mostly created to meet the expressed needs of the disabled participants. Hand "shoes" with soles made from old tires. 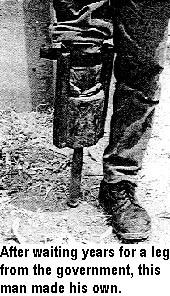 An orthopedic lift for a sandal or shoe, made from old foam-rubber "thongs"
Materials: Wooden planks, Glue, Nails and Old Tire( bicycle or car). Basic Tools: Saw, Hammer, Book (square), Sting (tape measure). Extra Helpful Tools: Drill, Chisel, Wood file, Wood plane, Clamps. The thickness of your planks will equal half the finished width of the wheel. 4 x (Diameter of the wheel plus 25 mm). 8 x (Half the diameter of the wheel plus 25 mm). NB: It is helpful if these eight pieces are wider than the four. Take each of the four long planks. Remove the central square to half the depth of the wood. Place the planks together with glue to form a cross. Use a book to keep angles at 90 degrees. If you nail the cross together, keep the centre clear. You will need to drill a hole for the axle. Repeat with the other two planks. Drill a small hole in the centre of the crosses. Put a nail in the drillhole and turn one cross a quarter turn. This will make each spoke at 45 degrees apart. Take the remaining eight wooden planks. Cut two of the corners off the planks at 45 degrees, one third of the width. 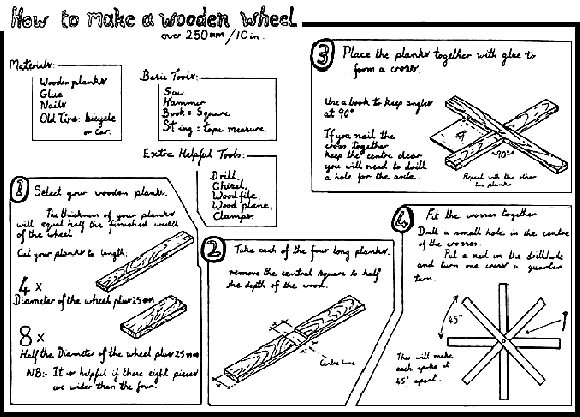 Fit four of the above planks on to one side of the wheel spokes to form a square. Glue well and nail in the centre of the planks into the middle of the underlying spoke. Clamp (or rock for a weight) and leave until glue is dry. Draw a circle to mark the edge of the wheel. Place a piece of wood with a nail in one end. The nail goes into the axle hole. The other end has a hole in it for a pencil or nail to go through, now use like a compass. Simply cut the extra wood off. Fit an old tire to the rim and attach by nailing into the side of the wheel. One of the workshop participants, MOSES, had been disabled by a land mine. He walked with great difficulty, supporting his weight with a pole. Moses very much wanted a wheelchair. At first this seemed virtually impossible, given the !ack of key materials, especially wheels. But the group was determined to try. The best building material they had was poor-quality, half-inch-thick planks they had scavenged from o!d packing crates. With suggestions from Moses and others, the group drew an initial design for a wooden wheelchair. When the final design was agreed upon, the drawing was enlarged to full size on packing paper, so that the different pieces could be traced onto suitable pieces of wood. 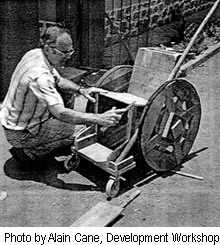 Kennett Westmacott had already taught the participants how to piece together large wooden wheels, using scrap wood from the packing crates. The group put together the wheels and the entire chair using nails pulled out of the packing crates and then hammered straight. The outer edge of the big wheels were covered with strips of rubber cut from old car tires. 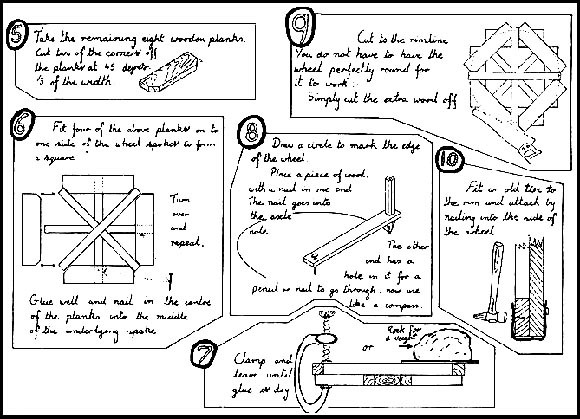 Instruction sheets for making the large wheels were provided by Kennett, and are reproduced (with minor modifications) on the two pages before this one. With 4 small ball-bearings they had found, they mounted the back wheels on an axle made from a length of 3/4 inch reinforcing rod. The bearings were force-fitted (with a hammer) into inset-holes chiseled into square pieces of Angolan hardwood, found by the scavengers. 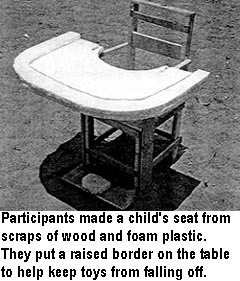 For the small front wheels of the chair, participants had hoped to use large truck bearings, similar to those that the street children use for scooters. But the bearings proved difficult to find. At last, someone located a couple of old plastic caster wheels, so these were used. No welding was needed for any part of the wheelchair. By dividing into small groups that worked at the same time on different parts of the project, the chair was completed in 4 days. It was remarkably sturdy and functional. Moses, who had played a key role in building his chair, loved it. As a last addition, he built a small box on the outer edge of the wooden footrest to hold the front end of his walking stick. Perhaps the most worthwhile part of the workshop was the understanding and respect that grew between the members. At the start, the directors of the rehab centers were hesitant to take part in the manual work. They were reluctant to put themselves on an equal footing with the disabled participants, many of whom were unschooled villagers. The disabled persons, in turn, seemed unsure of themselves and uncomfortable when working alongside the administrators. However, in the process of working and problem-solving together, everyone began to relax and to appreciate each other's skills. In some areas, such as measuring and interpreting graphic designs, the officials were more able. But in the use of tools and building of devices, many of the people with disabilities were obviously more capable. Each group learned from the other. By the end of the workshop, a strong sense of camaraderie had developed, and everyone seemed more confident. Another important outcome of the workshop was unplanned. The disabled participants, who came from many parts of the country, recognized that they had a lot of common concerns. They also realized that, by working together to try to solve one another's problems, they could accomplish a lot. As a result, they began to talk about forming some kind of a network, or organization. 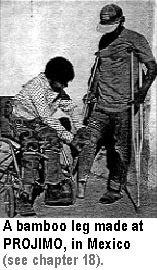 This was significant because, at that time, there was no association of disabled people in Angola. However, there was a major barrier to forming such an organization. At that time, because of all the terrorism and social unrest, the government prohibited all popular organizations, even at the community level. Fortunately, a high official in the Ministry of Social Affairs attended the closing ceremony of the workshop. The disabled participants presented to her their need and desire to form a national organization of disabled people. The official promised to arrange permission for this. We learned later that permission was granted, and an Angolan branch of Disabled People's International has now become a reality. However, when a leg-making team from the Swedish Red Cross visited the workshop, they brought a fully adjustable, low-cost prosthesis (artificial limb) created from local materials. Both the socket and the length of the leg could be quickly modified to fit different persons. This limb had a laced leather socket attached to a thin steel tube. The length of the tube could be adjusted by a simple telescoping mechanism. The Red Cross team attempted to fit the limb to the amputee in the workshop. However, they ran into a problem. In the 3 years since his amputation, the man had developed contractures and muscle weakness in the hip. Also, the stump was swollen and flabby. All of this made accurate fitting and safe weight-bearing on the adjustable limb impossible. Keep the stump bandaged, to prevent swelling and puffiness. An instruction sheet on stretching and strengthening exercises (partly adapted from the book, Disabled Village Children) was developed by the workshop facilitators. It was given to all participants so that they could work with other amputees in the different centers. That way, when there was an opportunity to get an artificial limb, the chances for successful fitting and use would be greater. Everyone agreed that there was a great need for dozens of small, decentralized limbmaking workshops in the provinces, preferably with disabled persons as technicians. Today, Angola has tens of thousands of amputees waiting for limbs. Although the war has more-or-less ended, hundreds of thousands of land mines still cover the landscape. So thousands of men, women, and children will continue to have their legs blown off. Unfortunately, the original exercise sheet, although it was designed by rehabilitation professionals, had some problems. The mistakes were pointed out to me, years later, by Ann Hallum, an outstanding physical therapist who reviewed the manuscript of this book. Question: Some of the exercises shown below should usually be done differently, or not be done at all. Do you know which ones? And why? Answer: CAUTION with exercises 1, 3, and 4. Exercises 1, 3, and 4 should be done differently. They can lead to muscle imbalances and contractures that make walking with an artificial limb much more difficult. After the loss of a leg, the person tends to hold his stump lifted up and out, like this. By doing this, he uses and strengthens the muscles that bend the stump up and out, more than those that bend it in and back. This results in a muscle imbalance that can lead to contractures that will interfere with walking. Therefore, it is best to do exercises to strengthen the weaker muscles that can help combat contractures. And stretch (but do not strengthen) muscles that contribute to contractures. To combat contractures, Exercise 1 should be done to stretch, not strengthen. Exercises 3 and 4 should be done lying down (to reduce flexion contractures of thigh). And if you do exercise 3, avoid opening the thigh to the side past mid-line. A corrected version of this exercise sheet is shown on the next page ... Live and learn! This is the corrected version of the Exercise Sheet shown on the preceding page. Full movement and strength of all these actions (except the first) need to be maintained through daily exercise. CAUTION: Use this exercise to stretch the muscles that flex the thigh, not to strengthen them. Don't lift against the weight; let it pull the thigh backward. Bend the other knee up, to prevent the lower back from bending instead of stretching the hip. It is usually best to avoid exercises that strengthen forward-lifting of the stump (hip flexion). As a general rule: DO THIS EXERCISE. ONLY TO STRETCH THE STUMP DOWN. DO NOT LIFT IT UP. Push to the side, trying to separate your legs. Pull with a lot of force against a belt, or a ring of inner-tube. Turn the leg outward, against the force of another person. Turn the leg inward, against the force of another person. *Note: With Exercise 1, it is important to let the hanging weight stretch the hip down. Do not try to lift the stump. This will help avoid hip flexion contractures (inability to straighten the hip) that would make walking more difficult. For a similar reason, do Exercises 3, 4, 5, and 6 lying down.